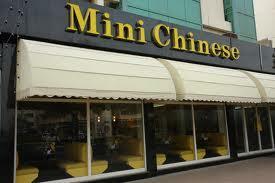 Mini Chinese Restaurant is to be found in the area of Satwa, Dubai, where it serves delicacies of Chinese cuisine. This fine restaurant has a pleasant environment and above all its food is pretty delicious, which attracts not only locals, but tourists as well. The menu includes all popular Chinese dishes, including poultry and meat items, seafood, duck, prawns, chow mein, vegetables dishes, various beverages, desserts and lot more. The management has kept the interior of this eating place quite neat and clean, which is another reason to admire Mini Chinese Restaurant, apart from its tempting and reasonably priced food. - Dine-in option for brunch, lunch and dinner. - The menu includes drinks, which guests enjoy with the food. - Children are welcome along with families. - Take away is also offered to the guests so they can take the delicious food of Mini Chinese Restaurant to their own place. To see the menu of Mini Chinese Restaurant, click here. Mini Chinese Restaurant opens each day of the week and its usual opening hours are from 11:00 am to 1:00 am. World Trade Centre Metro Station 2 is about 1.9 kilometres away from Mini Chinese Restaurant. This makes it a walking journey of 24 minutes roughly. If a patron heads in north direction from this metro station and then turns slightly left towards 308th Road. After that, the patron should turn left towards 308th Rd and then make a right turn onto 308th Road from where he or she needs to take a sharp left turn towards Al Diyafah Street/D 73 in order to continue straight onto Al Diyafah Street/D 73. Later, the patron will go through one roundabout and soon find the destination a few meters away. Directions from World Trade Centre Metro Station 2 to Mini Chinese Restaurant. Dhiyafa, Road 1 – Dubai bus stop is just 14 metres away from Mini Chinese Restaurant. Therefore, a bus user can easily reach this venue on foot in about 10 seconds, if he or she heads in the southeast direction on Al Diyafah Street/D 73 after arriving at this bus station. Bus numbers 7, C10, C15, X13 and X28 can be used to get to the station. 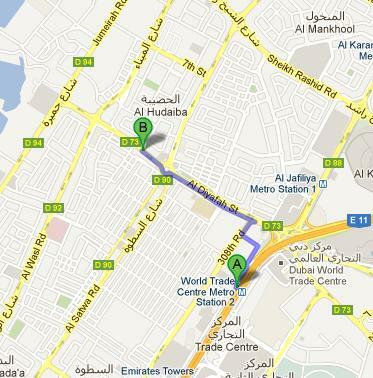 Directions from Dhiyafa, Road 1 – Dubai to Mini Chinese Restaurant.